The latest figures show almost 700,000 people travelled on the Borders Railway during its first six months of operation. The usage level is 22% more than was forecast for the route from Edinburgh to Tweedbank. Transport Minister Humza Yousaf said the passenger numbers further justified the decision to restore rail services to the region after more than 40 years. The multi-million pound route opened in September last year. Mr Yousaf said: "There has been a surge of interest in the Borders Railway since it reopened last year; this is evident in the number of people who have travelled on the line over the first six months since opening. "These figures are fantastic news for the region, further justifying the decision to bring a railway line back to the Borders for the first time in over 40 years. "The reintroduction of a rail service to the Borders is opening up communities in the south east of Scotland as new places to live, work and visit." He stressed that the Scottish government would be working to build upon the "positive start". "The success of the Borders Railway is further proof that Scotland's rail links are a powerful catalyst for economic growth," he added. Phil Verster, managing director of the ScotRail Alliance, said: "We are incredibly proud to operate services on the Borders Railway - a route which, as the numbers show, is hugely popular with our customers. "The extremely positive first six months is a wonderful start, and gives us a solid foundation on which to continue to attract new visitors to and from the Borders. "We are committed to ensuring the lasting legacy of the Borders Railway." 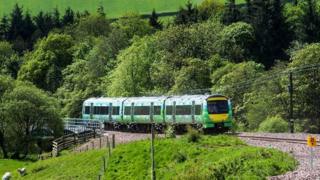 Scottish Borders Council leader David Parker said the figures showed the "transformational impact" of the railway. "To see five times the number of passengers expected using Galashiels railway station in the first six months of operation is remarkable, but for Tweedbank to have been used by almost 184,000 passengers in just six months is beyond our wildest expectations," he said. "I am delighted that Stow station has also seen use well above that projected prior to the opening of the Borders Railway and that over 200,000 people have used the line to travel from Edinburgh. "This justifies all the hard work, over many years, to bring about the return of the railway to the central Borders, and gives us a fantastic challenge to make the very most of this unique opportunity for the Scottish Borders. "It also shows how important it is to look seriously at the potential extension of the line to Hawick and beyond." Rail campaigners have previously described the usage predictions as "ludicrously pessimistic" and said they were not surprised by the popularity of the line.